Many homeowners postpone their home construction plans as the fall and winter kick in, due to weather concerns and delays. Weather absolutely comes into play with traditional construction. However, cold and wintry weather is of no concern when choosing modular construction. With this choice in home construction, it is possible to build homes even during the cold season. With modular building systems there are no weather delays. This is because the modules are built indoors where the weather condition cannot affect the process or the building materials. Site work is done at the same time and can be done on choice weather delays without delaying construction. When the modules are completed, they are then delivered to the actual site. The remaining 10% of the home building process, the final assembly and finishing touches, are performed. So in just a matter of 5-6 weeks, your modular home is completed and ready for occupancy. If you are planning to build a home this winter, choose to build a modular home. You can pursue this path to a new home during any time of year. Contact Tidewater Custom Modular Homes right away to get started with your dream home. It is a sellers market and it is becoming challenging for home buyers to find the right home. However, there are building lots available and smaller lots are convenient and can be afforded by first-time buyers. Given the better availability of lots, new home buyers should look at home designs that can maximize their budget and building space or lot area. 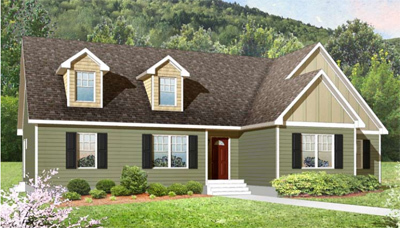 A two-story modular home is the perfect home design suitable for smaller residential lots. A two-story modular home , particularly the Henderson style floor plan, presents modern architecture fully-equipped with gorgeous home features. This modular floor plan maximizes the indoor living area with three spacious bedrooms, one with an attached bathroom in the upper level. With all the bedrooms located upstairs, the main level offers roomy living space with a vast kitchen and dining area. In fact, modular homes can be further designed it to meet your family's personal preferences. Homeowner also have the discretion to enhance the exterior the house for personal taste and curb appeal. This is possible with the advanced building systems of modular construction. For more details on the Henderson two-story modular home or other modular home design options, contact Tidewater Custom Modular Homes. Safety and comfort are the primary concerns of homebuyers when purchasing a new home. For homebuyers who are considering building a new home, here are some things to consider in regards to modular homes. Homes built through modular construction are sturdy and resilient. They can resist wind forces of up to 180 mph. The materials are precision cut to fit together perfectly and everything is fit and fastened in the manufacturing plant. Modular building systems applies the process of gluing and screwing all building materials with extra framing. Everything is reinforced to withstand transportation to the permanent building site and to withstand the craning onto the home's foundation. This makes modular homes tougher and sturdier, perfect for withstanding nature's violent strikes. Moreover, modular homes are equipped with state-of-the-art safety features such as wired-in smoke detectors and incombustible building materials that are used around the kitchen ranges and furnaces. Those homes built on pilings near the water are built with higher and better standards and design. Modular homes strictly abide by the HUD national codes for electrical and plumbing and always meet or exceed state and local building codes. In fact, oftentimes, lenders are more comfortable lending to those who choose modular homes over traditional construction. Contact Tidewater Custom Modular Homes for more information on modular homes. For empty-nesters, couples who are contemplating downsizing into a new home, a ranch style modular floor plan is a highly recommended design. This floor plan offers convenient living with no stairs or second levels. With a ranch style modular layout, all the home essentials are arranged on one floor for an an easy to maneuver home. Ranch style modular homes in Yorktown, VA offer high ceilings and open floor plans to make spaces that are roomy and airy. This set-up is strategically designed for convenience and so that aging adults can easily navigate and access all the inside the home. Ranch homes offer access to the entire house without the need to climb stairs. This is ideal for downsizing couples because ranch styles make living easy and comfortable. Furthermore, because there they are a one story home, it is easy to clean and maintain. Also, smaller lot spaces like ranch style modular homes make lawn and landscape upkeep easy. Indeed, ranch style modular homes provide a safe and convenient living environment for seniors. Contact Tidewater Custom Modular Homes to find out more about ranch style modular homes.